It was another packed weekend of collegiate track & field. Would you believe us if we told you there were 78 meets listed in the USTFCCCA InfoZone as of this past Friday? Spring has sprung! 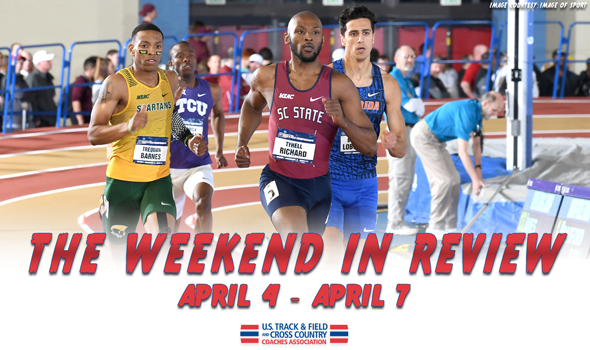 And while there weren’t many big invitationals or relay carnivals on the docket – such as the Florida Relays or Clyde Littlefield Texas Relays, which both happened last weekend – collegians from each level got after it with hopes of securing a bid to their respective national meet. Here are some of the highlights from the past weekend. A number of athletes stepped up in a big way across all collegiate divisions, but none more so than those in NJCAA Division I and NCAA Division II. That’s because athletes combined for 25 top-ranked marks in NJCAA Division I and 24 top-ranked marks in NCAA Division II, which is 11 more and 10 more than what athletes from NCAA Division III and the NAIA each combined to turn in (14 apiece). Tyrell Richard made his outdoor debut for South Carolina State at the UNF Invitational. Richard ran the open 400 and turned one lap in 44.81, which dipped well under the national-leading mark at the time (North Carolina A&T’s Trevor Stewart held it at 45.18). You might know Richard from his victory at the NCAA DI Indoor Championships last month when he clocked the fourth fastest time in collegiate history over 400 meters (44.82). That effort also landed Richard on The Bowerman Watch List. The Bulldogs will be staying close to home the next few weeks. Next up on the schedule for SC State are back-to-back meets at the University of South Carolina on April 13 and April 20. Last weekend saw 7 of the top-10 men’s scores and 9 of the top-10 women’s scores in the decathlon and heptathlon, respectively, posted on the Descending Order List at the Clyde Littlefield Texas Relays. Collegians that didn’t compete in Austin, Texas, were just waiting their turn. Johannes Erm took center stage at the Georgia Bulldog Decathlon/Heptathlon. Erm, a sophomore at Georgia, surged to the top of the national leaderboard with his score of 7913. Nathan Hite of Texas A&M owned the previous national leader with 7774 points. On the opposite side of the country, Michigan’s Jack Lint, Texas Tech’s Axel Hubert and Purdue’s Isaiah Martin put up some strong scores at the Jim Click Combined Events to move into the national top-10. Lint won with 7596 points and was followed by Hubert (7490) and Martin (7451). A pair of Kansas State Wildcats duked it out for top female collegian honors at the Jim Click Combined Events. Lauren Taubert ended up as the top collegian with 5669 points for a national top-10 mark, while Ariel Okorie came through with 5516 points for a spot in the national top-10 as well. Remember how we said that 24 top-ranked marks were turned in by NCAA Division II athletes this past weekend? Well, if you extend that to automatic qualifying marks for the NCAA DII Championships, that number blossoms to 37. Leah Hanle of Mount Olive got the party started on Thursday at the Colonial Relays when she clocked a winning time of 34:09.11 in the 10,000. That slid under the NCAA DII automatic qualifying time in that event by four seconds. Zach Jasinski of NCAA Division III UW-Whitewater hit a massive PR at the Rex Foster Twilight on Friday. Jasinski, who is a junior, cleared 5.21m (17-1) to take over the national lead in the pole vault by nearly nine inches. That mark also made Jasinski the 17th best performer in NCAA DIII history. The Warhawks were 12th in the most recent National Rating Index, so that should definitely help their billing come Tuesday.